We served a late night dinner party at Eleven Madison Park for about a dozen media people who included NBC's Tom Brokaw, the New York Times' R.W. (Johnny) Apply, Maureen Dowd, Todd Purdum, plus Purdum's wife, Dee Dee Myers, Bill Clinton's former press secretary. Following a marathon evening at the convention, they all finally sat down to a five-course dinner at eleven-forty-five. Before I left at one o'clock in the morning, I said, "If you folks stay long enough, we'll have to serve you scrambled eggs for dessert." And Johnny Apple, who's from Akron, Ohio, said, "I can tell you're a Midwest boy, probably attended a bunch of coming-out parties." I smiled. "In fact," I said, "it was by going to debutante parties as a nineteen year old in St. Louis that I first learned about eating scrambled eggs at two in the morning." "But I bet you've never had 'eggs daffodil'," he said. "That's the real thing." Kerry loved the recipe - he had cooked the eggs and cream slowly, put them in a blender with some beurre fondue, and then gently heated them up again, stirring in some zucchini blossoms - and said he had decided to put it on our brunch menu. We had served a wonderful dinner as it was. But when Johnny Apple made that remark about "eggs daffodil." it was as if he had presented us with a rock with all kinds of life growing underneath it, and we were then able to tie the right fly to catch the fish. Two years later, I saw Tom Brokaw at a dinner party, and he told twelve other people the story of eggs daffodil. Ask Johnny Apple or the others what they remember most about that evening's menu. I guarantee it's the eggs daffodil. After a bit of digging I discovered there are many variations - and most in fact use courgette blossoms. Courgette flowers have been in season for a few weeks in the UK now. They're amazing looking things with a delicate flavour. You can pick them up at farmers markets and good fruit and veg shops. We bought ours from Natoora whose produce is always exceptional. 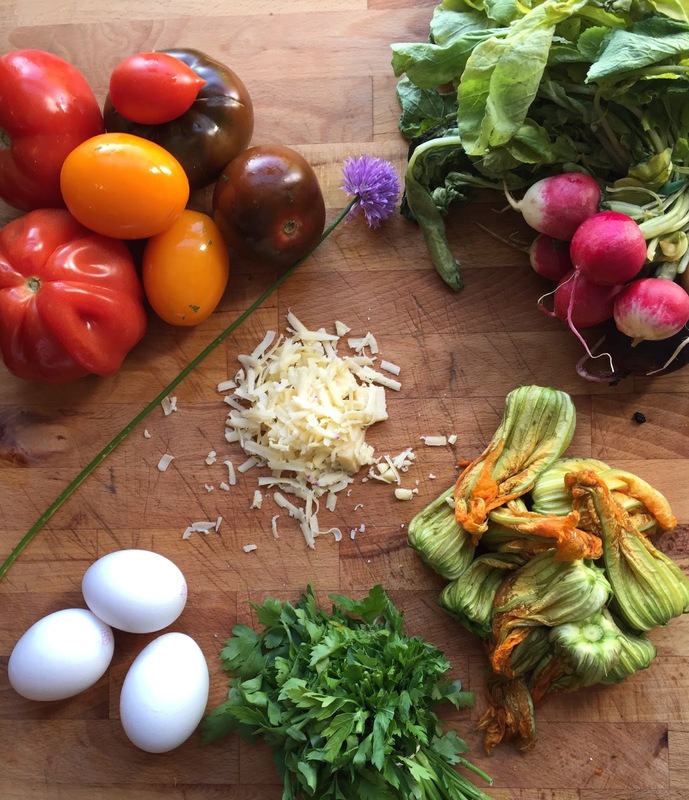 The basic idea is to make 'a very soft scramble of butter with eggs, zucchini blossoms, scallions and Comte (Gruyere) cheese'. (Louis Rousseau). After a quick rinse under cold water, take out the stamens, and then with scissors snip them into rough strips. 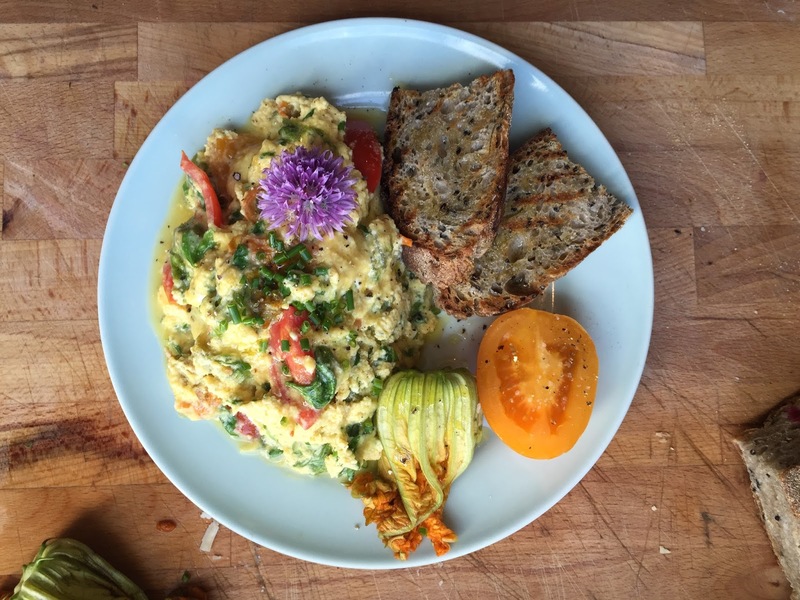 Fold the courgette flowers, heritage tomatoes, radish tops and some gruyere into buttery scrambled eggs just as they are browning. Top them with lots of parsley and chives and serve with homemade caraway rye sourdough toast. The resulting scramble is elegant and rich - ideal on a bright summer morning with a glass of juice (or Prosecco!). And we haven't tried them at two in the morning... just yet. This is a great recipe. This dish seems so easy to make at home. I will definitely include this to my cousin’s bachelorette party. Her wedding reception would take place at reception halls in Atlanta and she has hired traditional Mexican food catering services.